Modern design and excellent signal effectiveness make the new illuminated square keys from B&R useful for machine and system manufacturers. They can be illuminated in five colours (red, yellow, green, blue and white), and various combinations of single-colour and multi-colour keys are possible. The light fixture developed by B&R provides for uniform illumination of the key, which increases the readability of the key label. The labels can be printed directly on foil or installed as legend strips - and users benefit from maximum design freedom. Consisting of a short-stroke key, a light fixture and high-performance LEDs on a circuit board, the illuminated square key can withstand up to 1 million actuations. The key can be implemented with different embossing, depending on the requirements, which provides the key with an excellent tactile feel. The 16mm diameter of the key actuating area and a minimum spacing of 30mm between keys provide additional operating comfort. The hygienic surface design - with no gaps, edges or joints - makes the key modules suitable for use in environments where the highest level of sterility and cleanliness are required (eg in the food or pharmaceutical industries). With IP65 protection, the modules can also withstand the harsh industrial conditions. 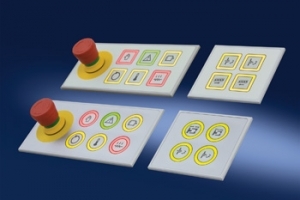 Various illuminated keys can be implemented in the complete system in many ways using B&R technologies (such as Automation Panel, Power Panel and Panelware). This allows entry devices to be placed at various positions on the machine. Four different types of modules permit placement anywhere on the machine, and distances of up to 100m can be bridged between the individual modules. With a B&R bus controller, the key modules can be easily connected to all standard bus systems such as Profibus DP, Powerlink, Ethernet/IP, Can (with Canopen and Devicenet protocols) and Profinet.